These will bear in the poorest soil and are desirable for hot, dry, sunny spots. They make excellent beds or borders and rock gardens. This variety contains mostly double blossoms but some singles will always occur. 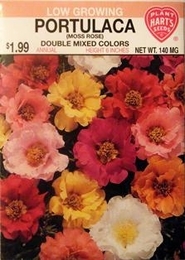 Portulaca does not normally need watering except during a prolonged drought. May be successfully planted outdoors as late as mid-June. Thinning - when plants are 2-3 inches tall thin to 5 inches apart.